Depending on where you live, it may or may not be quite soup weather yet. The temps are cooling off over here in the midwest, but to be honest, I’d eat soup even if it was one hundred degrees out (and I used to in Austin!). I love soup anytime and all the time! 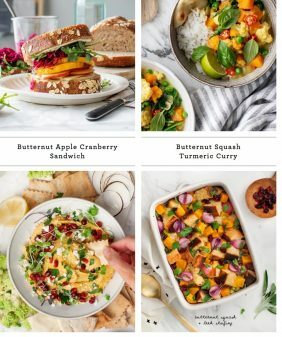 I love making it, I love eating it… I also love how it yields lots of leftovers that are almost always better the second or third day after flavors have had the chance to fully develop. 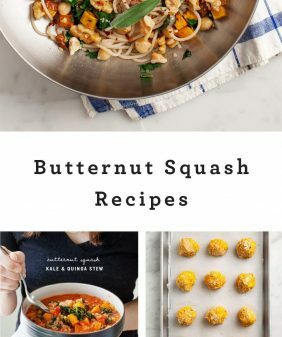 If you love soup as much as I do, here are some favorites you may want to add to your list this fall! 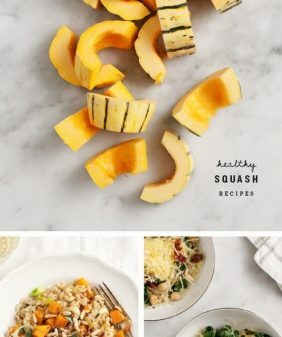 This is the first soup that I crave in the fall – if you can’t find a kuri squash, substitute butternut squash instead. This creamy soup is made with coconut milk, lemongrass, ginger, and red curry (hence the name) for spice. I get excited for winter just thinking about this one. I roast the whole cauliflower – cores and all. Its nutty rich flavor becomes a luscious creamy soup (without cream!) when blended with vegetable broth, thyme, a little lemon, and a few other secret ingredients. Sometimes my favorite soups start in the pantry – this one makes good use of both canned tomatoes and canned beans. Mushrooms, butternut squash, kale, and herbs get simmered down, making this a hearty one bowl meal if you serve it with a little crusty bread. While this one is on the ugly side, it remains one of my favorite stews. Sweet potato, ginger, lentils, and curry spices make thick hearty base and a bit of lime juice gives it an unexpected pop of flavor. The flavors here go so perfectly together! I hope you have some stale bread laying around, because you can transform it into this tasty Ribolita! Tomatoes, carrots, white beans, kale, a touch of white wine, and some good crusty stale bread make up this hearty soup that will get you through the winter. Waste not, want not. 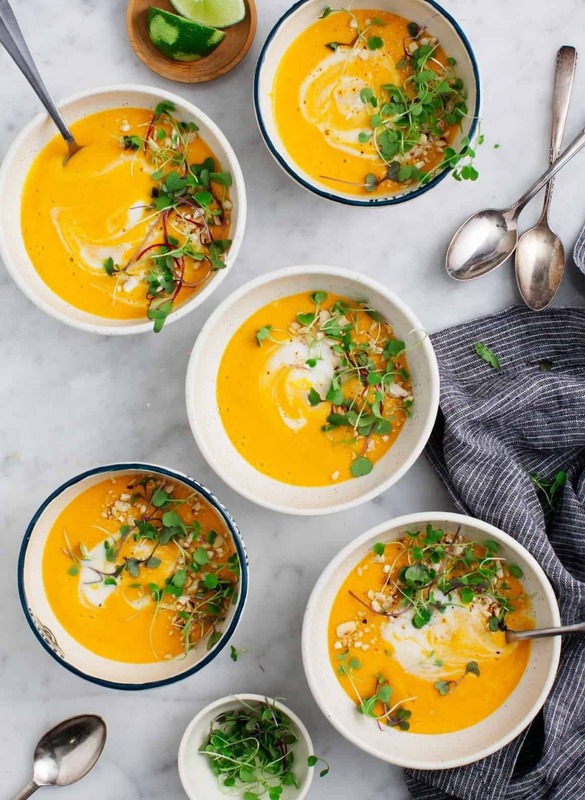 Use those beautiful carrot tops to make a pesto – it’s the perfect thing to swirl into this creamy 6-ish ingredient carrot-ginger soup. This recipe was inspired by a Vietnamese restaurant that was down the street from our Austin house. Now that we’ve moved, I’ll be making my own pho again – I call this one faux pho, because it involves a few shortcuts that make this soup possible to make relatively quickly. This one is a reader favorite because it’s so easy and quick to make. If you have a can of tomatoes, a can of white beans, and a blender, you’re pretty much there. This recipe is from Tess Masters’ The Perfect Blend. It’s one of my favorites because it’s packed full of vegetables (as the title suggests). There’s a clever twist where almond butter is stirred in at the end. It sounds a little odd, but the flavor combo is really incredible. For more soups, see the soup section of our recipe index! 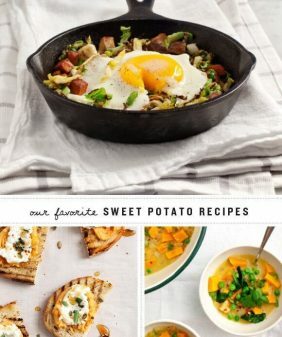 Always on the lookout for new and inspiring soup recipes; as I too eat it year round! Can’t wait to start adding these to my rotation! Loving the beautiful bowl featured with the Easy Vegetarian Pho! Thanks Mary, I hope you enjoy the soups! Love to know which and where the Vietnamese restaurant in Austin is….for the Easy vegetarian Pho. I’d love to give it a try. I’m all about creamy blended soups right now. 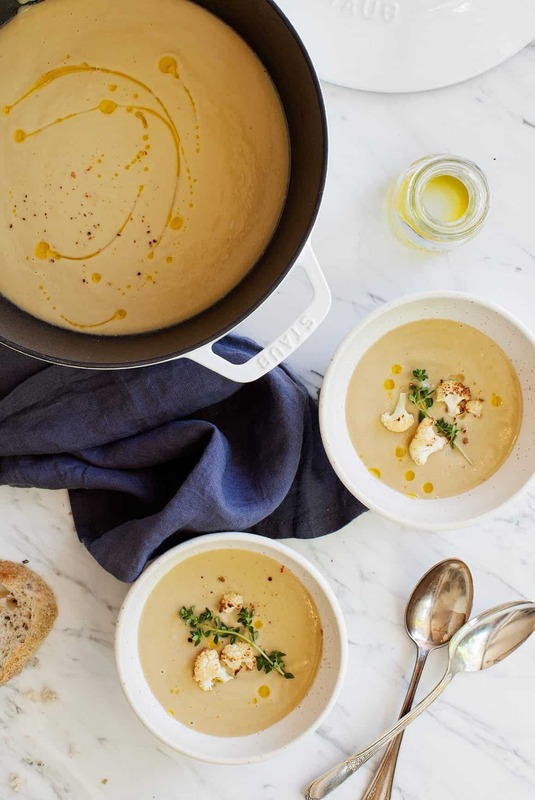 That cauli soup looks delicious:) Its totally soup weather here! 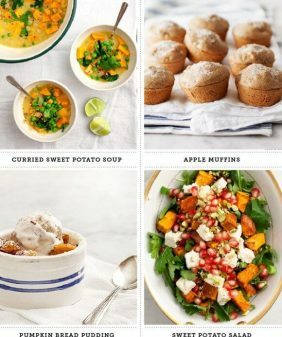 thank you for all of these, was just starting to look around for a good set of soup recipes and found this post! Never thought to add sone white beans to the tomato soup! It sounds delicious! Holy crap. Yum. Pinning this right now!! 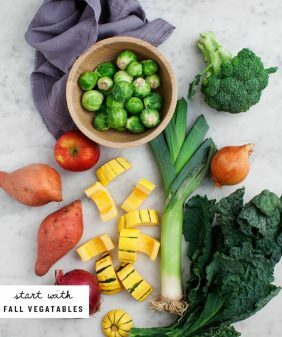 It’s SOUP season – woohoo!